San Francisco police detectives were following up on a report that Theodore “Creepy” Wilson and a gang of small-time thuggish friends had robbed Harry and Marguerite Turney at a drinking party a few nights earlier. On the morning of November 13, 1926, Detective Sergeants Earl Roney and Vernon Van Matre went to the basement flat at 1378 McAllister Street where Wilson was reputed to be living. The officers didn’t expect any particular trouble from their man, but because other members of his “gang” were thought to be present, they took along two other detectives as back-ups: Jack Palmer and Edward McSheehy. The officers had no way to know it, but soon Detective Roney would be fighting for his life with a bullet in his abdomen and the subject of one of the largest manhunts in the state’s recent history would lay dead on the floor, brought down in a pistol exchange with the detective. The string of events leading to that fateful morning had begun three years earlier. On September 18, 1923, San Bruno Police Chief Arthur Meehan, 30, received a report that an automobile had crashed through a railroad crossing bar on the Bay Shore road. Chief Meehan responded to the call himself on the department motorcycle. The Chief went to the scene where he saw the suspect vehicle departing. He gave chase, and as he pulled abreast of the vehicle in front of the San Bruno City Hall, the driver forced his bike into the nearby ditch. As the officer lay tangled up in his fallen motorcycle, the passenger exited the auto and shot the downed officer several times. Before he passed out, Meehan was able to get off several rounds himself, one of which went through the vehicle’s windshield, damaging the steering wheel. As was the custom in those days--when frontier practices and attitudes were still fresh in mind-- “posses of armed citizens of San Bruno and South San Francisco searched rooming houses and the railroad yards for the fugitives.” But the killers somehow slipped away. Two days later the Chief died at Mills Memorial Hospital. The auto, which had been rented the day before the shooting at a rental agency on Jessie Street in San Francisco by a man who gave the name of Joseph Murphy, was found abandoned with a gunshot through the windshield. Murphy turned out to be a fictitious name. In early October, the perpetrators were traced through a letter produced by a South San Francisco man named Frank Tanko from his half-brother Joe. 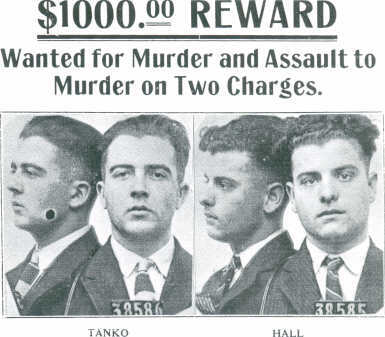 In the letter, Joe Tanko, 24, bragged that he had committed a number of robberies, and that he and his pal, Floyd Hall, had killed Chief Meehan. The suspects were quickly arrested in Los Angeles and openly admitted that they had shot the officer. Because they confessed, they avoided the death penalty and were sentenced to life terms at San Quentin. On their way to the lock-up, the culprits tried to seize the weapon of the transporting officer, Sheriff T.C. McGovern, but he was able to recover his weapon and deliver them safely to the prison. A year later, on April 7, 1925, the convicts escaped together from San Quentin by picking a lock and sliding down the wall on a jute rope. Shortly thereafter, the escapees were spotted on a road near Petaluma. A posse gave pursuit but lost their quarry. Over the next several days, posses of armed police officers and citizens searched for the bandits all over the North Bay. The duo was reported to have burglarized a store in Petaluma for clothing and the next day one in Healdsburg, where they obtained weapons and ammunition. On April 12, the two fugitives carjacked a Santa Rosa rancher who they threw out of the car near Novato. The auto was found abandoned the next day near Davis which shifted the locus of the search to the Sacramento Valley. On the 14th, they held up a taxi driver in Sacramento and escaped after an exchange of gunfire with Sacramento police. On April 18, Harry J. Litzberg was killed by two men thought to be the fugitives during the robbery of his Sacramento store. Armed posses searched the swamps and river banks around Sacramento. On the 21st two holdups and carjackings in Sacramento were attributed to the two escapees. Two days later, the wanted killers carjacked a man named F.R. Harlow and his four year-old daughter at 17th and Q streets in Sacramento, and forced him at gunpoint to drive them away. A small boy saw the crime and notified police officer Clyde Nunn who commandeered an automobile and took off after the robbers. As the officer’s car pulled abreast of the fleeing vehicle, Tanko fired into the car, hitting Officer Nunn. The fugitives drove on with the man and his daughter until the car ran out of gas, and then they fled then on foot. A massive manhunt was organized but somehow the wanted men managed to avoid capture. It was almost a month later, on May 15, that Hall was arrested in a Sacramento rooming house by local police. It seems that Hall, who had split up with Tanko so as to call less attention to themselves as a pair, encountered a friend from San Quentin on the street and asked for his help. The friend put him up in a rooming house where Hall was told to sleep under the bed so he wouldn’t call attention to his presence. The $1000 reward offered for the arrest of the killers of Litzberg and the shooters of Officer Nunn proved too attractive, however, and the friend tipped off the police to Hall’s whereabouts. The focus of the search for Tanko soon switched to San Francisco. As in any major case, tips flooded in. Witnesses say they saw him on train to Oakland. He was also supposedly spotted on Montgomery and Market and at the Particular Lunch counter near Polk and Bush. Chief Daniel O’Brien issued orders to the district captains. “Tanko is believed to be in San Francisco. Order every patrolman to be on guard and to shoot to kill at the first sign of trouble,” the Chief commanded. On May 18, it was reported that Tanko carjacked another driver, Chester Buntley at 3rd Avenue and Lincoln Way, and forced him at gunpoint to drive downtown. When they ran into a traffic jam at Kearny and Broadway, the man jumped out of the car and disappeared into North Beach. Buntley drove to Central Station a few blocks away at 641 Washington Street where he identified Tanko as his kidnapper from photographs, and the fact that his abductor had an Italian accent. On the 24th, Chief O’Brien received a post card, presumably from Tanko, claiming that he was heading south to dispose of his half-brother Frank who had assisted police with their prosecution for the murder of Chief Meehan. In fact, Tanko was probably nowhere near San Francisco at the time. It later turned out that Tanko, after separating from Hall, hid out for several days in a Chinese den in Sacramento before heading for Colorado where he had lived previously and had spent time in the reformatory. In Colorado, he later told criminal accomplices, he sustained himself by robbery. But for some unexplained reason, Tanko did return to San Francisco in late 1926. Perhaps on some level he wanted to be caught, for he was well known on sight to city detectives from the months he had spent in city prison awaiting trial for the killing of Chief Meehan. He holed up at “Creepy” Wilson’s place on McAllister Street where he spent his time playing penny-ante poker and going out at night to attend the movies. The excitement level was high in the city at the time because just a month earlier Buck Kelly and his fellow “Terror Bandits” had terrorized the city with a two-day drive-by murder spree which left four men dead and more than a dozen wounded. Tanko is reported to have told his fellow roomers on McAllister Street that he disapproved of such senseless killing. The death house at 1378 McAllister. The ambulance obscures the entrance to the alley leading to the basement apartment. 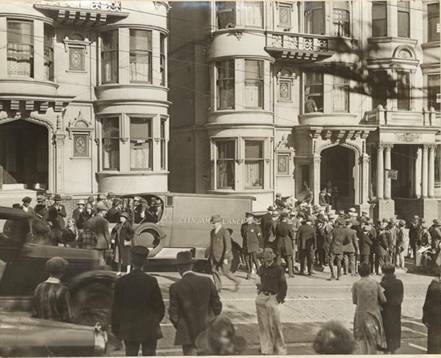 When the officers arrived at 1378 McAllister on the morning of November 13, 1926, they had no idea what was in store for them. Detective McSheehy took the rear of the building; Detective Palmer positioned himself in front of the alley entrance to the apartment on the west side of the building; and Detective Sergeant Van Matre took the adjacent window, the only visual aperture into the apartment. Detective Sergeant Roney placed himself in the upper hallway of building, at the door leading up from the basement apartment. When Detective Sergeant Van Matre eased up the window, he observed Willie DeBardelaben, a member of “Creepy” Wilson’s gang, lying on a bed. The officer ordered DeBardelaben, who was known to him, to raise his hands and step away from the bed. DeBardelaben made to comply but then halted, saying that someone was holding a gun on him. Van Matre climbed in through the window and was halfway over the sill when he was shot in the groin by Tanko who was lying in the bed, out of Van Matre’s line of sight. Roney returned fire, hitting Tanko five times, and sending him sprawling backwards down the stairs. Roney had been so close to Tanko when he fired that Tanko’s clothing was set afire. When news of the shooting—and that Tanko had been involved—got out, crowds assembled outside the McAlllister Street address. Over the next several days, 10,000 interested citizens, Sacramento Officer Nunn among them, lined up and wended their way through the Coroner’s Office – in the quaint custom of the time—to view the dead bandit. Many commented that he didn’t look as large as they had expected. The San Francisco Chronicle took the opportunity to editorialize about “the helpless desperation of the law, reports of various crime commissions, [and] the maudlin viciousness of pacifism in the war on criminals” as all dramatized by Tanko affair. “Through a quirk in the law,” the paper opined, “a concession to mawkish sentimentality, the murderers’ confession saved their worthless lives. If they had been hanged the first time it would have saved everyone a great deal of trouble.” And three officers, we might add, would not have been shot. For himself, Tanko, whose family was otherwise respectable, is reported to have blamed his criminalization on the associations he made in a Colorado reformatory where he spent time for a minor infraction brought about by want. One suspects that today’s Chronicle would be more inclined to agree with Tanko’s analysis of the situation than it’s own of 85 years ago. Detectives Roney and Van Matre were feted as heroes in the city, and honored by the Board of Supervisors. Both officers recovered from their wounds and returned to duty, later retiring for service. Sacramento Offcier Nunn returned to duty as well but was retired 1940 from complications from injuries incurred in his shooting. Floyd Hall was acquitted for the shooting of Officer Clyde Nunn in a Sacramento court-- to the cheers of scores of female groupies who had attached themselves to him during the trial. He was later tried for the murder of Sacramento storekeeper Litzberg as well. After two trials and a judicial intervention, the charges were dismissed. Hall was sent to Folsom Prison to serve out the rest of his life sentence for the murder of Chief Meehan.